Introducing MeshProTM Insoles by Progenomics LLC. A new concept insole made in Japan that puts ultimate aeration technology at your feet! Introducing MeshProTM Insoles by Progenomics LLC - a new type of insole that keeps feet dry, refreshed, and protects them from odors. MeshProTM Insoles are made with over four hundred and fifty 3D nylon-polymer honeycomb shaped cells that form an open mesh to allow for the greatest level of air flow possible. The natural honeycomb design makes MeshPro Insoles extremely durable and lightweight. When you try them on they feel surprisingly soft and supportive. A slip-resistant polymer evenly coats the underside of each cell in the insole to ensure that it remains fixed reliably in place, even after long hours of vigorous activity. MeshProTM Insoles can be cut to size from twenty to thirty centimeters, or 7.9 to 11.8 inches, so they are made for everyone. 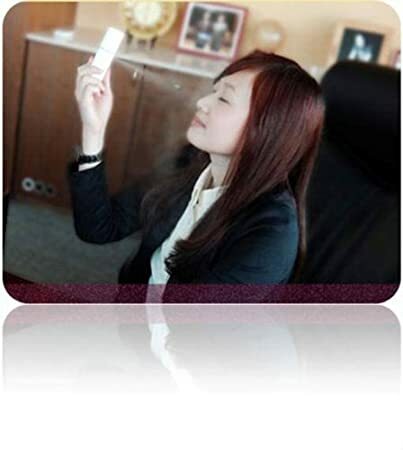 MeshProTM Insoles are precision machined in Japan to top quality standards. MeshProTM Insoles – ultimate aeration technology at your feet. The NanoDri Men's Sweat-Blocking undershirt is built from thin breathable structural polyester, with sweat absorption on the inside and a sweat resistant barrier on the outside of the entire surface of the shirt to ensure sweat-hiding confidence. The breathable double sided mesh structure and micro air space maximizes air flow and evaporation, leading to faster drying and a cooler body. Additionally, the deep V neck makes the shirt invisible when wearing button down shirts. The shirt is machine washable in cold water, and needs no special detergents, treatments or ironing. The material is also anti-bacterial/anti-fungal-treated to maintain freshness and prevent odors and bacterial biofilms from forming. Introducing Twiggi Lights: Stylish Water Proof Credit Card Sized Flashlights. We are an official licensee of the renown artist Christian Riese Lassen©. · Find your keys or money in the dark! The amazing drink holder that employs physics to ensure you never spill a drop. Introducing the Aquamist, an Ultrasonic Lipstick-Sized Portable Beauty Steamer. Its that time of year when we look for any products that can make living in the heat more bearable. The Aquamist is one such product. This powerful portable steamer is not much larger or heavier than a lipstick case and quickly converts water into a fine cool mist that instantly increases the level of moisture in skin to effectively avoid skin moisture loss. Compared with other portable steamers, this little gadget packs a real punch, converting 1 ml of water in its 10 ml reservoir (a reservoir volume that is larger than any other portable steamer and double the flow rate of many other popular models) to ultra-small water droplets only 15 micrometers in size in just 30 seconds, with high speed ultrasonic vibrations that top 180,000 times per second. Since skin pores are about 40-70 micrometers in size, the water particles produced by the Aquamist are easily absorbed into the skin. Micron-sized particles are known to spread more evenly over the skin, which means the Aquamist is able to deliver superior moisturizing and skin care. 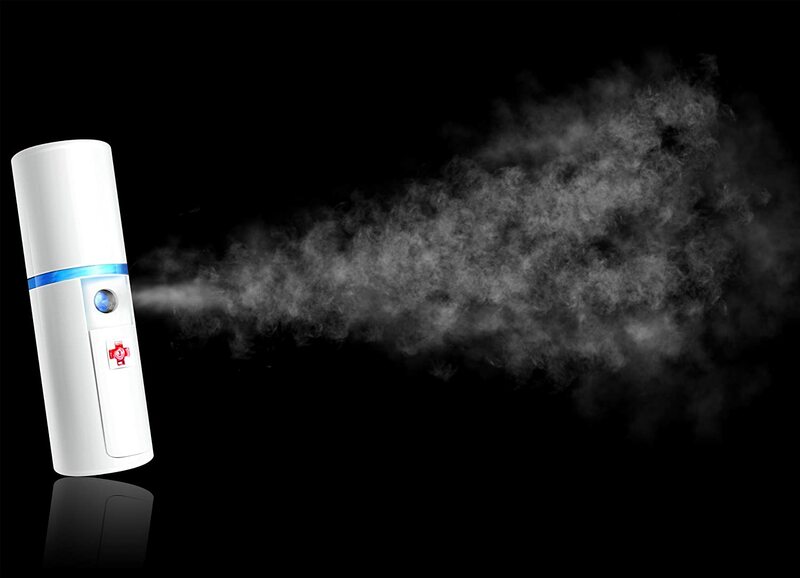 In addition to its powerful misting action, the Aquamist is just as convenient to use. A flick of the thumb and it slides open, releasing cool mist for 30 seconds. Additionally, there are no separate parts; just open the top and add water. The device runs on 2 AAA batteries. The Aquamist was designed and manufactured with Laser-LIGA technology, which is based on the electroforming of polymer moulds formed by excimer laser ablation, the type used in the production of microelectronic devices, for eye surgery, and micromachining. In creating the Aquamist, this laser process was used to make the micron sized holes from which water is shaped and extruded. The technology allows the holes to be produced with depths of up to several hundred microns and with a surface roughness of only 100 nm. This means that every water droplet coming out of the Aquamist is of a uniform size and shape because the holes are very smooth. This results in an even coating of the skin and maximum absorbance of moisture into the underlying skin layer. In addition to use for beauty applications and in combating dry air during winter, there is an additional benefit to using the product in summertime. Because the mist particles are so small, their overall surface area is much larger compared to typical misting fans. This means that evaporation occurs over much more of the surface of the water particles that come out, resulting in an accentuated evaporative cooling effect. For a demonstration on how refreshing the Aquamist can be, set it up near you in front of a fan at your office or home and switch it on. You will instantly feel refreshed and cooler than by using a fan alone. Applications of the Aquamist include: Basic skin care after face washing, make up fix, moisture for sunburns, itch-soothing, smoothing out hair, cooling down in summer, hot flashes, moisturizing the air in dry places such as airplanes, hotel rooms, etc. You can also add a few drops of your favorite aroma to the water to turn your steamer into an aroma delivery device.